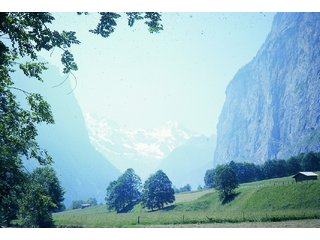 Photo of a glacial valley in Lauterbrunnen, Switzerland. 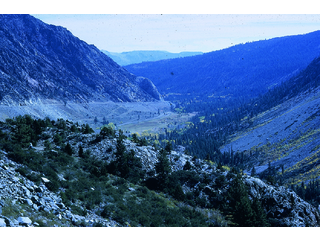 A glacial valley is formed by the glaciation of a stream valley. Snow-capped mountains are seen in the distance. Photo of a boulder near June Lake, California. 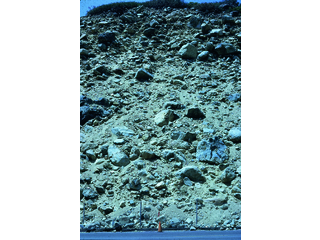 The boulder is part of glacial till and was likely deposited at this spot during the glaciation of the surrounding area. Photo of glacial till. 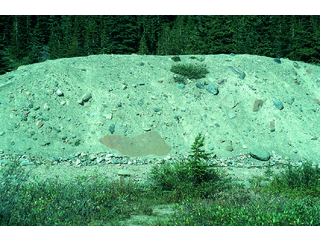 Glacial till is unsorted rock material that is deposited during or after the process of glaciation. 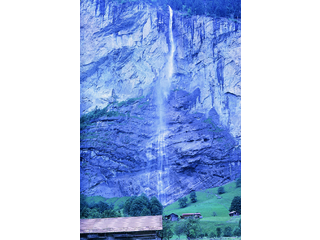 Photo of a hanging valley waterfall in Lauterbrunnen, Switzerland. 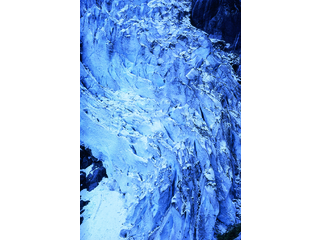 Hanging valleys are created during glaciation when smaller tributary glaciers form high in the valley walls. Waterfalls and streams are sometimes created when the tributaries melt. 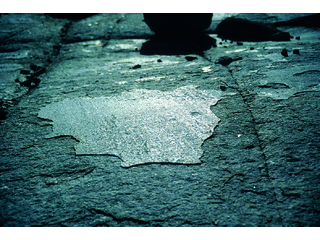 Photo of glacial polish on a section of rock. 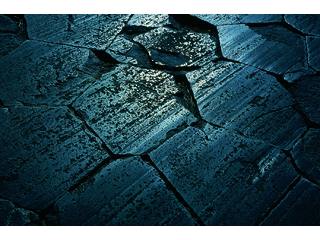 Glacial polish is the smoothing or polishing of a rock surface that occurrs when the rock has been worn smooth by a passing glacier during glaciation. 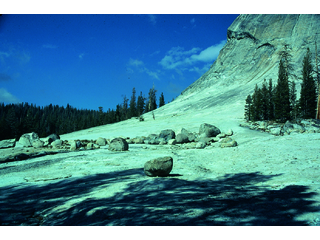 Photo of a glacial cirque in Tioga Road, California. 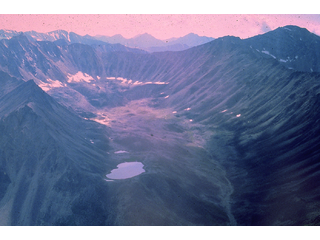 Glacial cirques are circular, bowl-shaped basins with steep walls that form from the erosion of land by large glaciers. Photo of people standing on the edge of Taft Point in Yosemite. 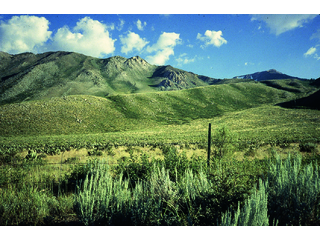 Photo of a glacial moraine on the edge of the eastern Sierra Nevada Mountain Range. Glacial moraines are formed when till, or rock material, is picked up by glaciers and is moved and deposited to form a large mound. Photo of Yosemite Falls waterfall system. Yosemite Falls is an example of hanging valley waterfalls that form after tributary glaciers have melted. 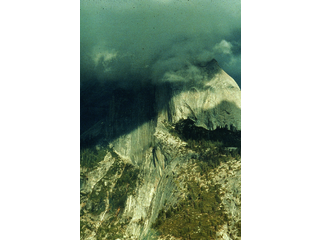 Photo of the Half Dome rock formation in Yosemite National Park. The formation overlooks a glacial valley and is an example of an exfoliated dome, which means that rock layers weather and fall off in sheets of boulders and slabs. The unique rock shape formed before the glaciation of the valley. 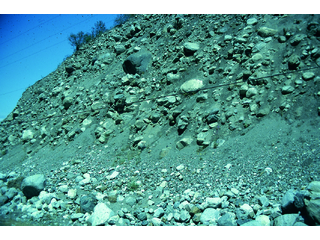 Photo of glacial outwash deposits, which are unsorted rock material carried by the melted water of a glacier and deposited in stratified layers. 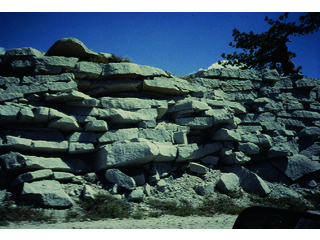 Photo of spalling granite, which is the separation and breaking away of layers of stone. This is sometimes caused by the freezing and thawing of the rock. 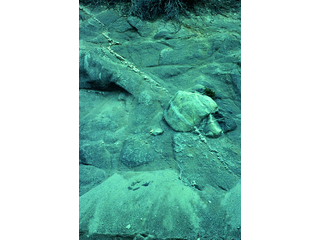 Photo of glacial grooves in New York City. 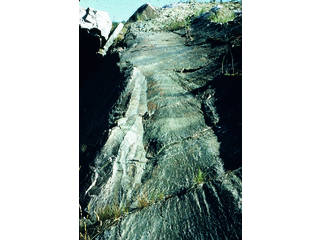 Glacial grooves, also known as glacial striation, are parallel lines or grooves in a bedrock surface. They are formed by the deposition of loose rock material that was once embedded in a glacier that has passed over the rock surface. 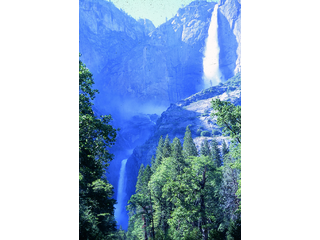 Photo of Yosemite Valley. Yosemite Valley is a U-shaped glacial valley that was formed when a mountain icefield and glaciers formed as the Sierra Nevada range grew higher. 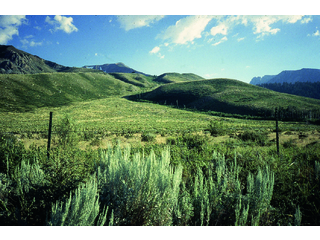 The glaciers flowed down many of the valleys in the surrounding area. 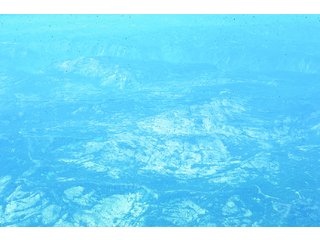 Photo of the granitic surfaces of the Yosemite area near the Sierras. 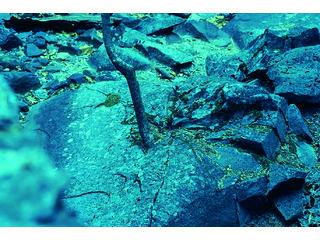 Photo of a small tree growing out of a boulder and cracking the stone at its center. 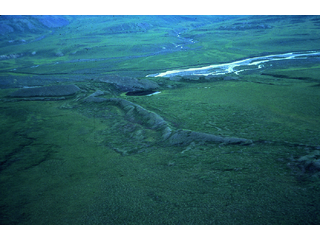 Photo of eskers, which are lengthy serpentine ridges of drift material typically formed by streams that ran under glacial ice. 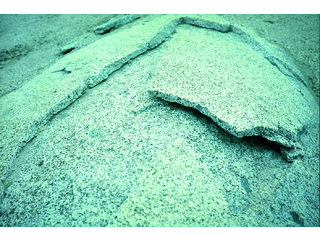 Photo demonstrating the exfoliation of granite in the Sierra Nevada Mountain Range. Exfoliation occurrs when rock weathers and falls off in boulders or large slabs. Photo of a natural dike running through granite. 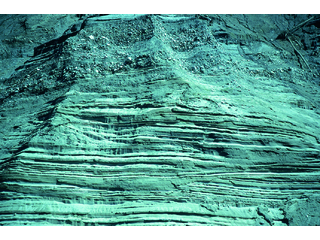 Dikes are formed when magma crystallizes underground as it is flowing up toward or out of the surface of preexisting rock. The dikes are revealed through erosion. 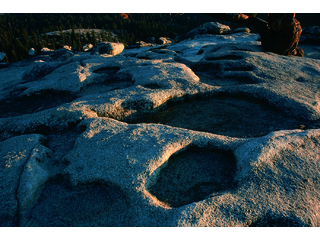 Photo of granite weathering pits, or panholes, in Yosemite, CA. The pits are formed by the long-term weathering of the rock. The weathering pans specific to this region are known for expanding wider more so than deeper. 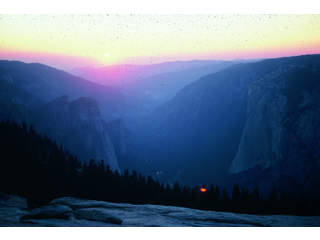 Photo of the sun setting over Yosemite National Park. Photo of the Merced River and surrounding area as seen from Glacier Point in Yosemite National Park. 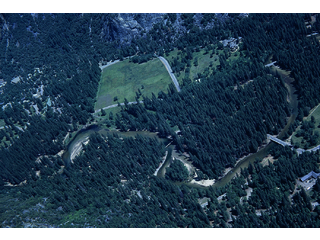 The Merced River is a main tributary of the San Joaquin River and flows through Yosemite National Park. 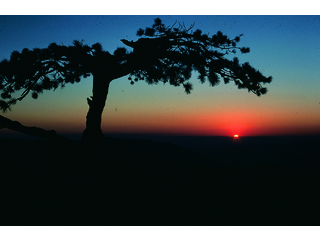 Photo of the Jeffrey Pine tree that formerly stood on top of Sentinel Dome, a rock formation at Yosemite National Park. It is a granite dome. 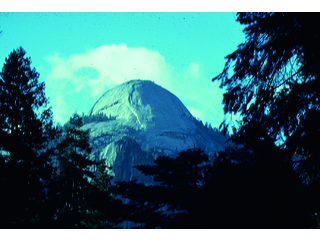 Photo of a series of domes in Yosemite National Park. 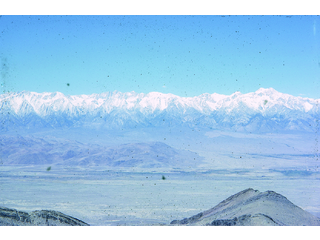 Photo of the snow-capped eastern sierras of the Sierra Nevada Mountain Range. 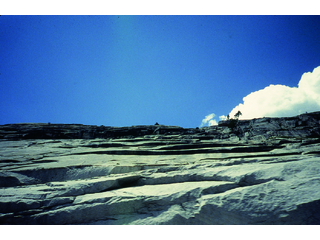 Photo of erratic rock in a fissure at Taft Point in Yosemite. 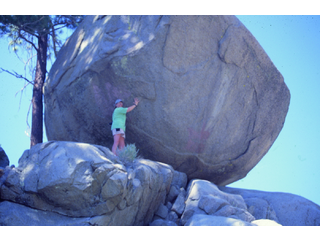 An erratic is a transported rock that doesn't match the local bedrock of the area it has settled in. These occurr when glaciers pick the rocks up and transport them as they move or melt. 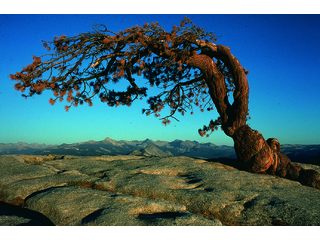 Photo of minaret mountain formations in the Sierra Nevada Mountain Range near Yosemite. 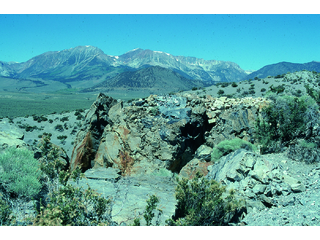 Photo of moraines located at the Panum Crater east of the Sierra Nevada mountains. A large volcanic eruption blew the top off the peak and created the crater. 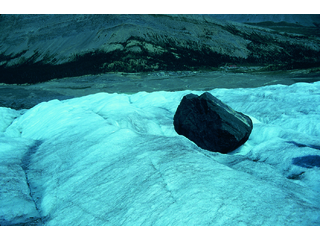 Glacial moraines are formed when glaciers pick up till, or rock material, and it is redeposited in large mounds. 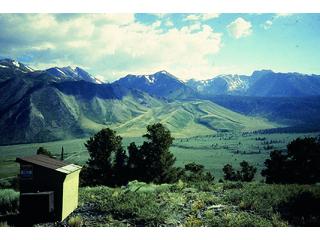 Photo of the area surrounding Tioga Road in California. The road is the highest in Yosemite and one of the highest highway passes in California. 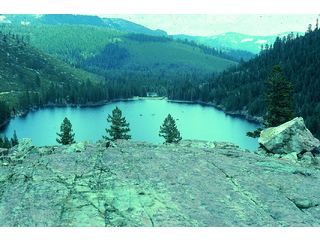 Photo of one of the lakes in the Sardine Lakes system located in the Sierra Nevada Mountain Range and Tahoe National Forest. Photo of an elevated gorge at Yosemite National Park. 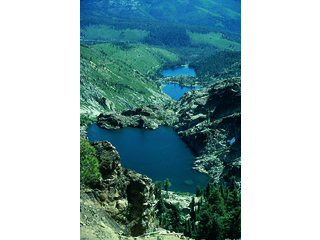 Photo of the Sardine Lakes located in the Sierra Nevada Mountain Range and Tahoe National Forest. 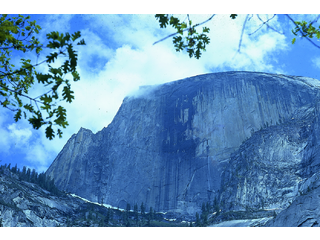 Photo of the North Dome rock formation at Yosemite National Park. The dome is granitic in composition. 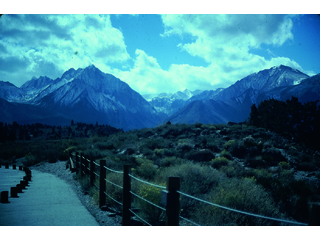 Photo of the mountains surrounding Convict Lake in the Sierra Nevada Mountain Range. 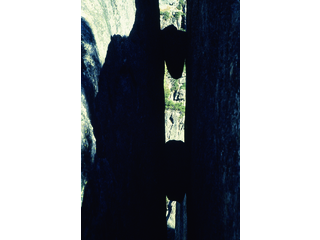 Photo of the octagonal rock formations at Devil's Postpile. The stone shows signs of glacial striation, which are parallel lines or grooves in a bedrock surface. They are formed by the deposition of loose rock material that was once embedded in a glacier that has passed over the rock surface. Photo of a small iceberg in Alaska. 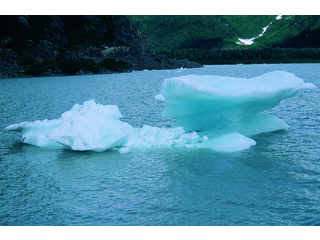 Icebergs are pieces of ice that have broken off from glaciers or ice shelves. Photo of the Athabasca Glacier in the Canadian Rockies. 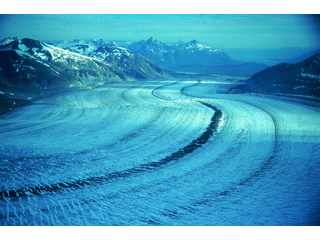 The glacier is part of the Columbian Icefield in Canada. 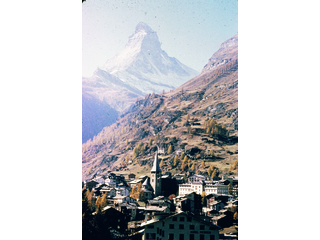 Photo of the Matterhorn Peak near Zermatt, Switzerland. The mountain is one of the highest peaks in the Alps and rests on the border of Switzerland and Italy. Glaciers reside on the bases of the mountain's sides. 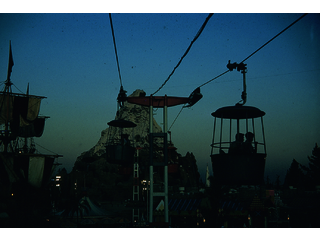 Photo of the Disneyland replica of the Matterhorn Peak. Photo of a fjord in Norway. Fjords are long, narrow inlets of sea bordered by steep cliffs. They are created when glaciers cut valleys and later melt. Most fjords are extremely deep, some deeper than nearby seas. 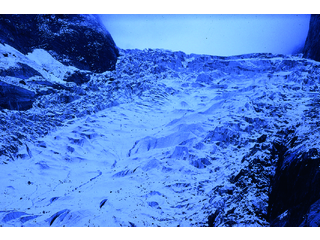 Photo of glacier drainage. 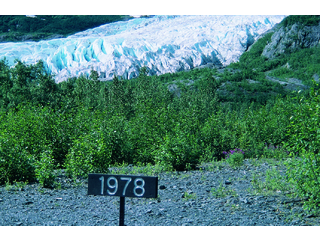 Glacier drainage occurrs over a steady period of time as the ice produces meltwater, which drains out of the ice or beneath it. 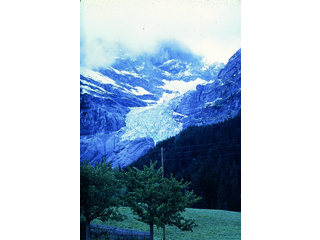 Photo of a glacier located in Grindlewald, Switzerland. Grindlewald is home to two valley glaciers, the Upper and Lower Grindlewald Glaciers. Photo of a pingo in Noatak, Alaska. 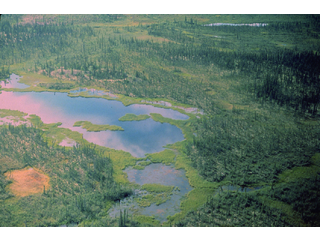 A pingo is a mound of earth-covered ice that exists in cold climates and permafrost environments but is not glacial. Photo of the area surrounding the Sierra Nevada Fault. 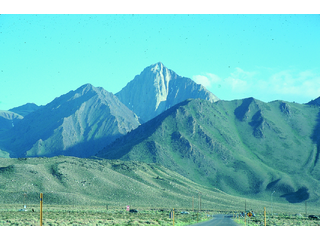 It is a seismic fault near the eastern edge of the Sierra Nevada mountains, and is also responsible for the uplift of the mountains. A glacial valley is seen in the mountains in the background. 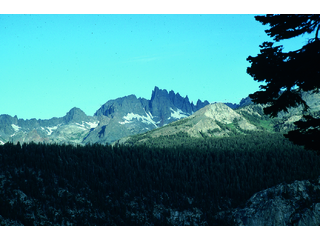 Photo of a section of the John Muir Wilderness near Horseshoe Lake and Mammoth Lakes. 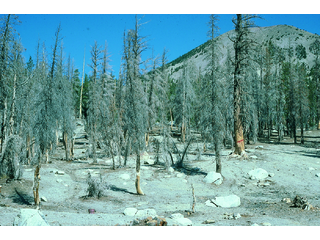 The trees in the photo are all dead, possibly as a result of excess Carbon Dioxide rising from the surrounding soil. 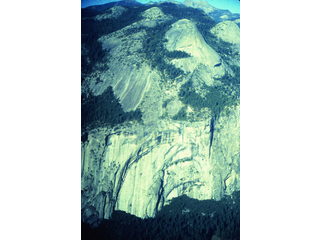 Photo of erractic rock and exfoliation in the granitic rock of Yosemite. Erractics are transported rock material that don't match the local bedrock of the area it has settled in. These occurr when glaciers pick the rocks up and transport them as they move or melt. Exfoliation is the weathering and falling off of rock in large boulders or slabs. 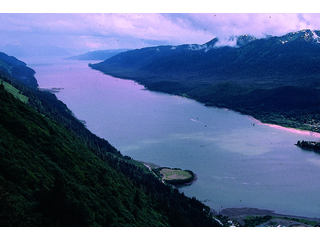 Photo demonstrating the retreat of the Exit Glacier in the Kenai Fjords National Park near Sewarda, Alaska since 1978. 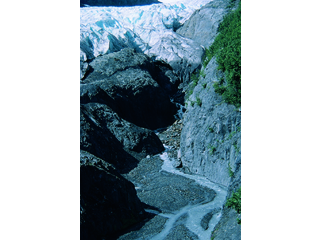 Photo showing glacial milk in Alaska. 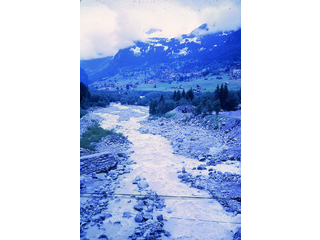 Glacial milk is created when glacial erosion or grinding occurrs on bedrock and creates silt-sized particles, or rock/glacial flour, that is then suspended in the glacial meltwater creating a cloudy or "milky" appearance. 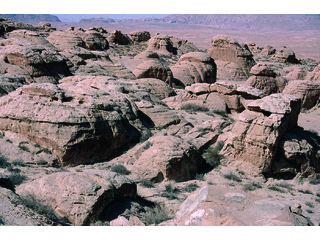 Photo of sandstone domes in the Jordanian desert. 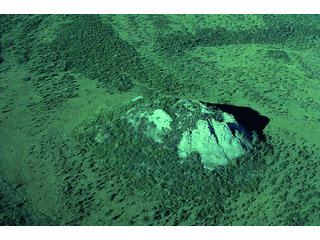 The domes show signs of severe weathering. Photo showing crevasses on a glacier in Switzerland. Crevasses are deep cracks or fissures in the ice sheet that form as a result of the movement and stress generated when a glacier moves over changing landscapes or when parts of a glacier move at different speeds. Photo showing crevasses on a glacier. Crevasses are deep cracks or fissures in the ice sheet that form as a result of the movement and stress generated when a glacier move over changing landscapes or when parts of a glacier move at different speeds. 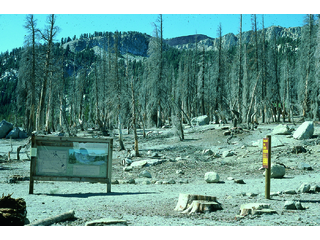 Photo showing a section of the forest in Mammoth Park. 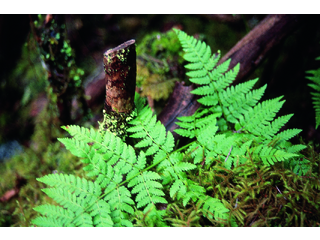 Photo of a fern plant growing in the wilderness. 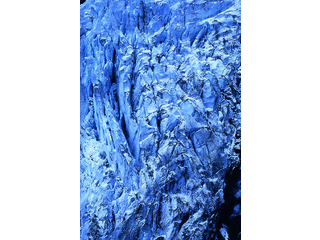 Photo of glacial ice as seen from close up. 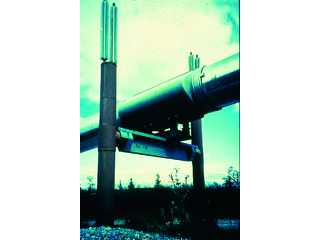 Photo showing a section of the Trans-Alaska Pipeline, which carries crude oil. The pipeline had to be uniquely constructed due to the cold conditions and permafrost that surrounds much of the line. As such, the majority of the line is above ground so as not to cause thawing of the permafrost, which might in turn cause sinking. Permafrost is soil that has been frozen for a length of time and doesn't thaw as the seasons change. 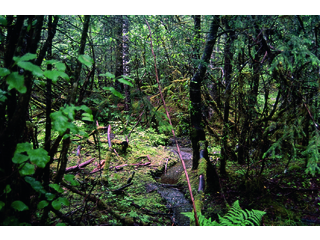 Photo of a section of forest in Alaska. Photo of a section of the Athabasca Glacier as seen from atop the ice. 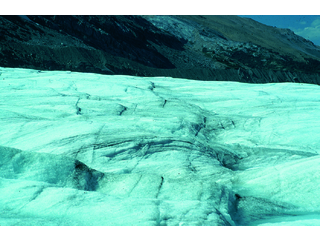 The area in front of the glacier shows evidence of its retreat. Photo of the Athabasca Glacier ice close up. A small crevasse is visible on the ice surface. 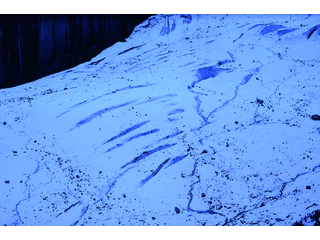 Photo of a blue ice crevasse in the Athabasca Glacier in Canada. 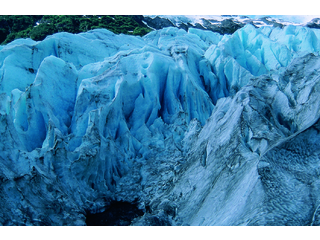 Many crevasses or recent breaks in glaciers will display blue ice, as ice in the middle of the glacier is more dense. Glaciers and snow appear white because there are more air bubbles at its exposed and therefore warmer parts, and so the ice reflects the full spectrum of light. 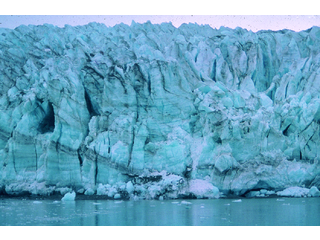 The blue color seen in deeper parts of glaciers occurrs because it is the only color not absorbed that deeply into the ice. 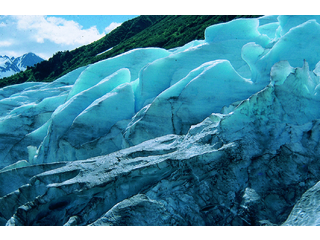 Photo showing the glacial moraines of a glacier in Alaska. Glacial moraines are formed when till, or rock material, is picked up by glaciers and is moved and deposited to form a large mound. The photo also demonstrates the glacial flow of the ice. Photo of a fjord in Norway. Fjords are long, narrow, inlets of sea bordered by steep cliffs. They are created when glaciers cut valleys and later melt. Most fjords are extremely deep, some deeper than nearby seas. 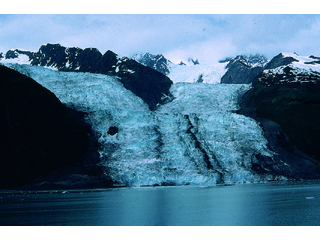 Photo of a glacier located in College Fjord, Alaska. Fjords are long, narrow inlets of sea bordered by steep cliffs. They are created when glaciers cut valleys and later melt. Most fjords are extremely deep, some deeper than nearby seas. The fjord area is home to five tidewater glaciers, which are glaciers that end in water, as well as five valley glaciers and many smaller glaciers. Crevasses are visible on the top of the glacier. Photo looking down onto the top of a glacier. Many small gaps and crevasses are visible. 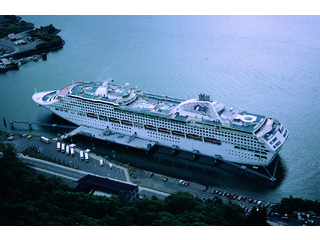 Photo looking down from a cliff onto a cruise ship at port in a fjord in Skagway, Alaska. Skagway is located in a glacial valley next to the fjord in Lynn Canal, which is the deepest canal in North America. 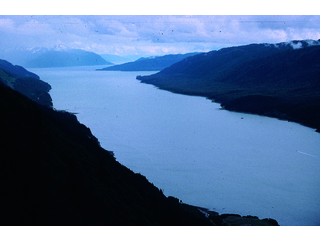 Photo of a glacial valley in College Fjord, Alaska. The area around College Fjord is home to numerous glaciers and glacial valleys, many of which are visible by water. 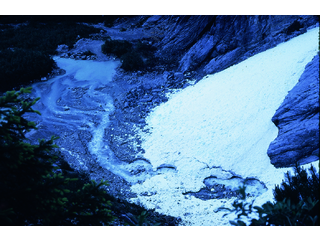 Photo of a stream of glacial milk in the Canadian Rockies. 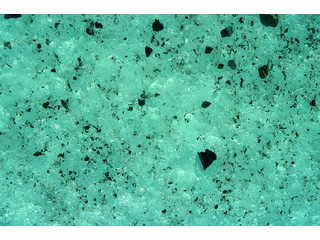 Glacial milk is created when glacial erosion or grinding occurrs on bedrock and creates silt-sized particles, or rock/glacial flour, that is then suspended in the glacial meltwater creating a cloudy or "milky" appearance. Photo depicting glacial moraines. 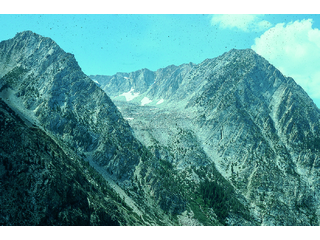 Glacial moraines are formed when glaciers pick up till, or rock material, and it is redeposited in large mounds. 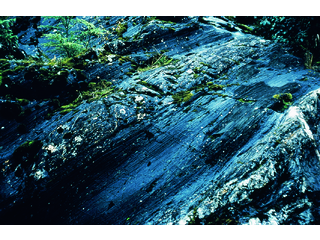 Photo depicting glacial grooves. Glacial grooves, also known as glacial striation, are parallel lines or grooves in a bedrock surface. They are formed by the deposition of loose rock material that was once embedded in a glacier that has passed over the rock surface. 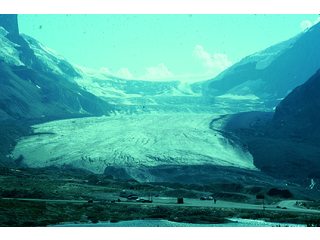 Photo demonstrating the retreat of the Athabasca Glacier since 1965. The glacier is part of the Columbian Icefield in the Canadian Rockies. The glacier is visible in the distant background. Photo of the glacial ice on the Athabasca Glacier in Canada. 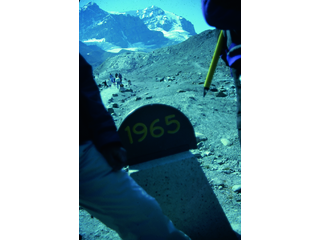 Photo showing a fault line feature, or large discontinuity, on the Athabasca Glacier in Canada. 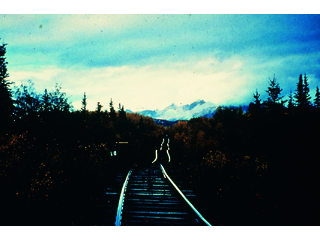 Photo of Alaska Railroad tracks that are elevated and protected from the permafrost. The construction and use of railroads can often upset the frozen permafrost's temperature and consistency, which leads to thawing of soil and subsequent sinking or uneveness of ground below tracks. 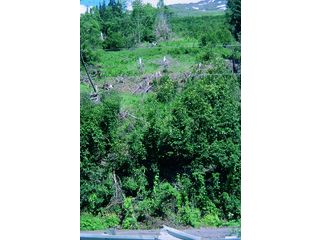 Photo of a wooded hillside with some minor forest damage. 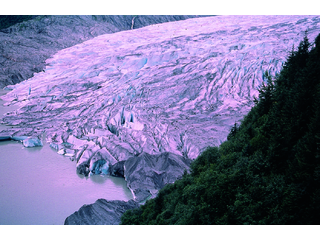 Photo of a large tidewater glacier in Alaska. 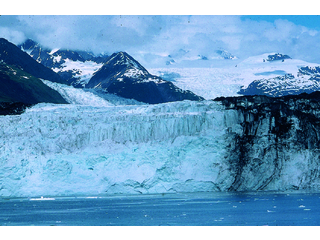 Tidewater glaciers are glaciers that end in water. The typical u-shape of a glacial valley is seen above. 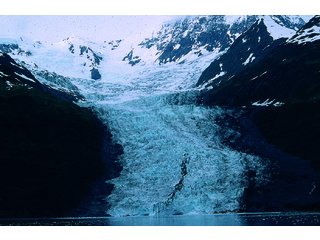 Photo of two merging valley/tidewater glaciers. 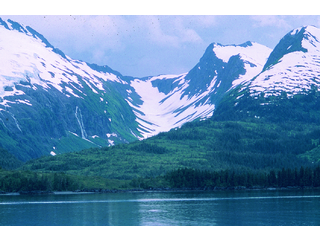 The glaciers are both valley and tidewater as they began in the valley and end in the water. The typical u-shape of a glacial valley is seen on the upper left and right sides. Photo of a large section of glacial ice on the edge of the water. 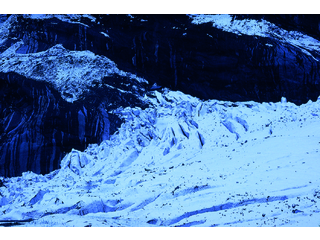 The ice has likely recently broken away from another section of glacier, as it is blue, which is how the more dense ice that is unexposed to the surface appears. 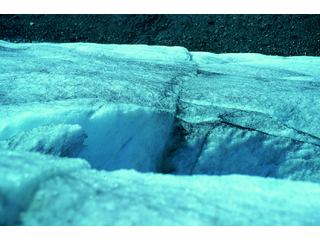 A small section of water appears at the bottom of the section of the glacier. Many shallow crevasses and ridges are visible on the surface of the ice. 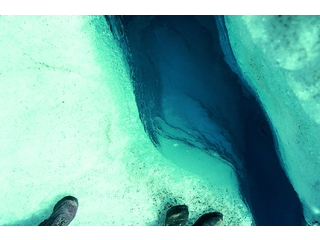 Photo of a section of ice on a tidewater glacier. Numerous spiky ridges and crevasses are visible in the ice. 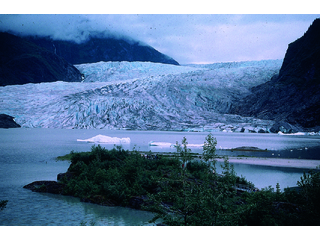 Photo depicting a tidewater glacier in Alaska. 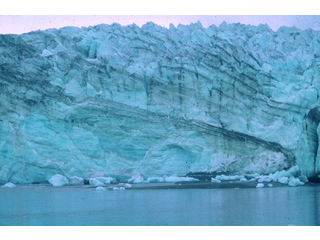 Tidewater glaciers are glaciers that end in water. The typical u-shape of a glacial valley is seen above. 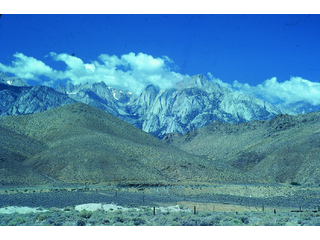 Photo of a section of the eastern Sierra Nevada Mountain Range. Photo of a glacial melt stream. 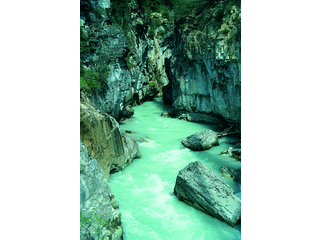 Glacial melt is sometimes called glacial milk when glacial erosion or grinding occurrs on bedrock and creates silt-sized particles, or rock/glacial flour, that is then suspended in the glacial meltwater creating a cloudy or "milky" appearance. 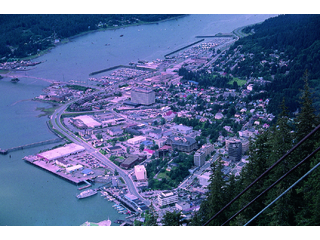 Aerial photo of a portion of Juneau, Alaska. Photo of a section of ice on a tidewater glacier. Numerous spiky ridges and crevasses are visible on the ice. Many icebergs are visible in the water.